Summary: The Mother-Daughter Book Club makes one final appearance before its members go their separate ways. It’s the summer after high school, and Emma, Jess, Megan, Becca, and Cassidy have all been hired to work as counselors at Camp Lovejoy in New Hampshire. As in the other books in the series, the story is told in chapters narrated by each of the girls. When camp begins, homesickness is rampant in the girls’ cabins, and they decide on a cure—start their own Counselor-Camper book club, reading the classic Understood Betsy by Dorothy Canfield Fisher. As the summer progresses, both the campers and the counselors stretch themselves to learn new skills and try new challenges. 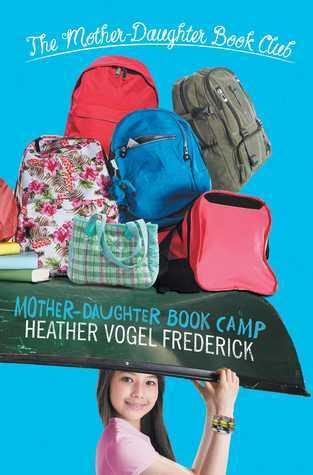 By the time parents come for pick-up, homesickness is forgotten, and the five girls are ready to head off to college. 336 pages; grades 4-7. Pros: Fans of the series will enjoy learning what’s happened to the five girls from Concord, Massachusetts since sophomore year when the last book took place. There’s lots of good clean fun, and the romance is pretty G-rated, making this a good choice for upper elementary as well as middle school. Cons: There’s not a lot of diversity in life paths, as everyone in the book seems to be going to a top-notch four-year college.